An artifact* can be defined as a man-made object mostly of archaeological or historical interest and it is consequently implied that the artifact is often quite valuable. Carl Barks constructed many stories in which this type of an artifact was important to the plot. Some of the artifacts were based on generally well known objects, but most of them he invented himself. On this page you are presented to a mixture of artifact examples from both groups. Scrooge longs to be part of the posh inner circles but he lacks the position. Then he remembers he owns a prestigious ruby. The ducks' findings constitute one of the greatest feat in the history of archaeology, as they find numerous large stone tubs filled with sorted, priceless gems such as diamonds, opals, sapphires, rubies, and emeralds - but they have to leave in a hurry with nothing! The parrot Yellow Beak is hiding from Black Pete in Donald's seashore tavern. Out of gratitude he shows the way to an old buried treasure. After having beaten Black Pete and his pirates Donald and Captain Yellow Beak can split the contents of the treasure chest. 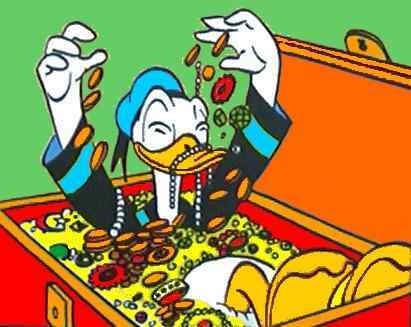 After having retrieved a priceless ring and captured a criminal Donald is rewarded a chest full of valuables. The 1-cent magenta stamp is from the real world. It came in 1856 and is considered to be the rarest ever. Barks failed to present the stamp correctly; it has an octagonal and not a rectangular shape. Deep down in the cellars dwells a strange, cloaked man whose only ambition in life is to build a replica of the cathedral from coins. These are all collected from a deep, public wishing well inside the building. 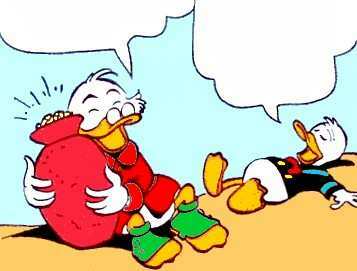 When Scrooge gives Donald a whole sack of the special dimes, he thinks he is 'in the money'. But Scrooge knows what he does; the money will be next to worthless when they are not scarce anymore. 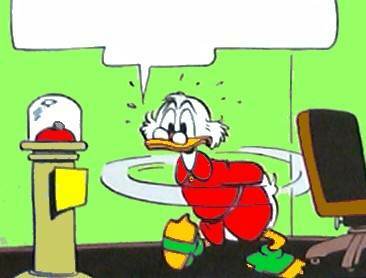 Scrooge, Donald and the nephews are blown up in the air to a nearby, small planet. It seems to be Valhalla, the home of the ancient gods! Once again we witness Scrooge's blind fascination with gold; this time he has got hold of the Roman God Vulcan's hammer, that can transform any metal to gold! The ability to transform matters also emerged in U$40 Oddball Odyssey, where Magica de Spell got hold of the Greek sorceress Circe's magic wand. The nephews are given Scrooge's hourglass which uses special red sand from the Noissa Oasis. Accompanied by Donald they leave to find the sand. Initially, Scrooge uses the very old hourglass every morning in order to time his breakfast eggs, but it becomes useless to him when the sand inside it suddenly ... wears out!? Scrooge's old heirloom watch, that has been with the family for 200 years, needs to be repaired in order to receive an inheritance. Apparently, all the ducks carry pocket watches as demonstrated in several stories. The most sophisticated one is the nephews' specially designed Junior Woodchucks calendar watch in this story. He who bears The Golden Helmet can call himself King of North America. Many are interested. Including Donald! 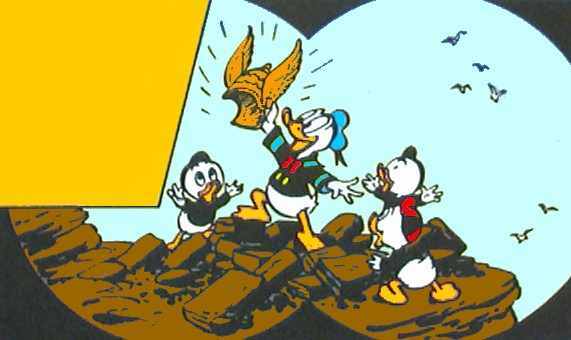 Scrooge lures Donald and the nephews to the Himalayas where a precious gold crown has been stolen from him. The hunts for Scrooge's lost items in this story are divided into items lost in the past and in the present. This item - from the past - has the added incentive of being referred to as a historical artifact, namely the crown that the Mongolian emperor Genghis Khan wore. Alas, the crown only existed in Barks' fantasy, although it is a plausible symbol for any emperor. 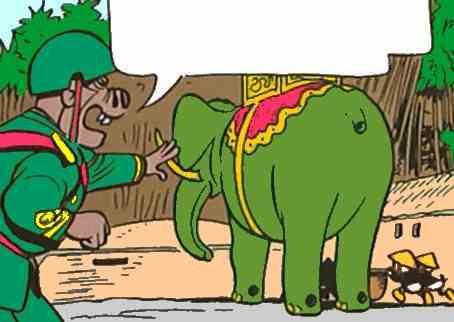 Scrooge buys a flying carpet at a bazaar in Bagdad but only Magica knows how to use it! 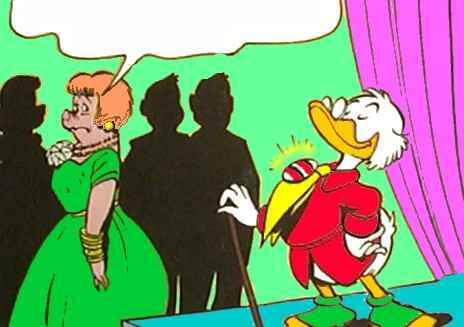 The only recurring artifact in Barks' stories is Scrooge's Number One Dime, which he earned sometimes in the 1880s. It seems to be a general misconception that Scrooge keeps his old dime because it brings him luck, but in this story Scrooge says to Donald: Bah! Mere superstition! Thriftiness is the secret of my wealth! And this old dime is a symbol of that thriftiness - nothing more!